Create an oasis in your backyard with our Amish Pine Wood High Back Heart Glider. This pine wood furniture is extremely durable and was built to be used outside. Order our water sealer stain for the ultimate protection against the climate and elements. 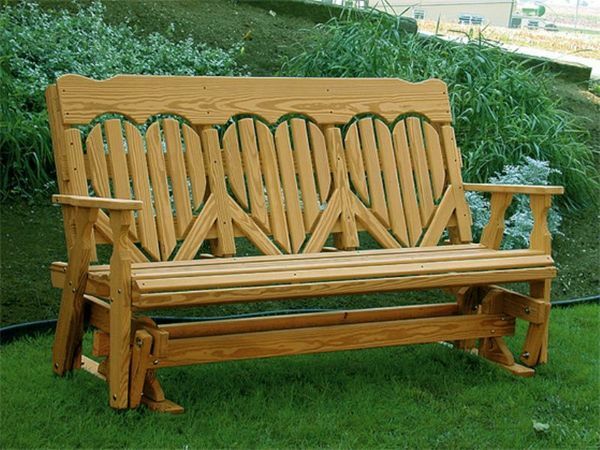 Family and friends will never want to get up from your comfortable new pine glider bench. This pine glider bench is also perfect for the front porch, terrace, garden area or outdoor waiting spot at commercial locations. This heart design on our Amish Pine Wood High Back Outdoor Glider Bench is sure to transform your outdoor space with a touch of love. Choose from a 4', 5', or 6' length each offering more room for family and friends. Please realize that when you order different sizes the amount of hearts on the bench will vary. I would like to take this opportunity to share my recent experience with your exceptional DutchCrafters' representative, Shannon, and your brilliant woodshop team, by acknowledging how grateful I am for their help and how much their assistance means to me. On December 8th I contacted Dutchcrafters to determine if your company could build a custom support base for a slider I had purchased from you when I first purchased my home many years ago. While the original 'Heart Seat' was in beautiful condition (see attached pic), the chain support base had completely rotted and had been discarded. What made this slider 'irreplaceable' and very special to me was that my son - who passed 5 years ago - and I used to sit on it, talking and spending special time together in our garden. Although I had tried, I was unable to find anyone locally who would rebuild the support base so I could put the slider back in the garden where it belongs. My call to DutchCrafters was a last ditch effort to see if there was any chance your company could help me. It was such a blessing when Shannon picked up my call! From the moment we connected until the order was shipped, Shannon showed extraordinary care, commitment, sensitivity, and unrelenting follow-through to do EVERYTHING IN HER POWER to help make my request happen. Not only did she and your woodshop team work together to go above and beyond 'standard business practice', they took great care to identify the specs, measurements, and hardware needed for them to rebuild - and for me to reassemble - the 'off-site' slider with ease!! What was most reassuring was that, Shannon communicated and kept me 'in the loop' at all times during the process to ensure my confidence and that the accuracy of information needed to do so was successful! While there was a glitch when I received and assembled the slider, as a result of Shannon's previous detailed emails with me, the issue was resolved immediately and my beautiful slider is back in my garden giving me great comfort! It is poignantly clear to me, that Shannon is not only an outstanding representative and valuable asset to your company, she is a very special and caring person! Thank you!The wedding was beautiful! The guest loved the idea of a guest sign in bench! And the bride and groom were thrilled with it.